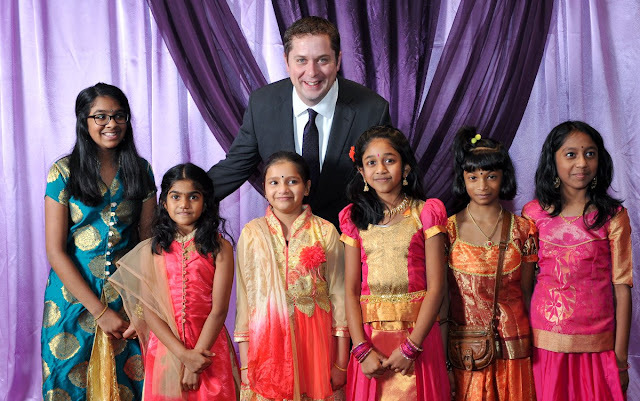 Andrew Scheer celebrating the "New Face of Canada"
If you are like me, you are prone to spending more time receiving news and info-tainment from the new alternative media outlets than from more traditional sources. If so, you may also, like me, have found that these so-called “conservative alternative news outlets” are as much part of the problem as the leftist establishment media. If not so, you may be asking what I mean. I shall explain. The topic of this session is not something that I only recently have weighed in my mind. However, the news from UCP of Alberta leader Jason Kenney about a rural immigration program – sounding suspiciously like a similar initiative by federal immigration minister Ahmed Khan – have forced my hand. 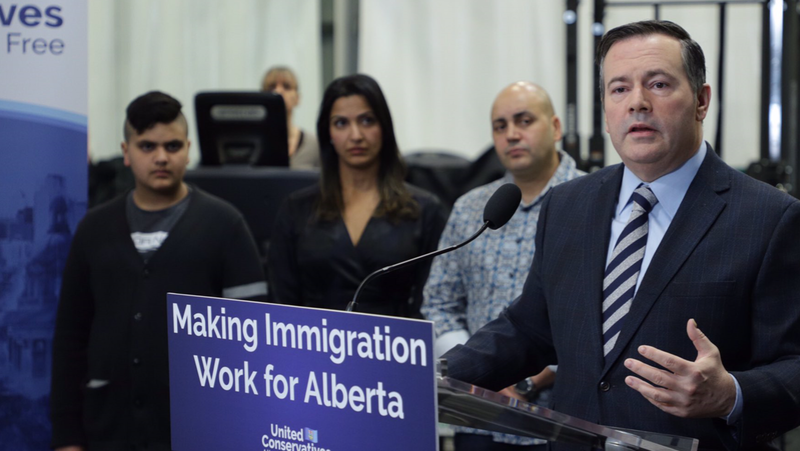 The initiative is summarized in the title, "Jason Kenney announces immigration plan to attract entrepreneurs to rural Alberta". The chances are good some of the readers have considered the same thing. Moderate, “controlled opposition” types of the "dark web" or "conservatives" — TheRebel.media, Breitbart.com, TheBlaze.com, UKIP, Ford Nation (of the Ontario PCP) and so on — tend to have one thing in common. That thing they hold in common is a complete surrender, or at best a partial surrender, of the immigration topic to the ultra-left and globalists. I don’t care whether you’re white, black, yellow, brown, green, blue – I care about hiring the best person for the job. I believe in judging people not by the colour of their skin but by the content of their character. I believe in merit. The last phrase is always said with the most triumph intonation. First of all, I find it particularly sad that, in spite of our people producing over the centuries more great orators, poets, philosophers, scientists, and artists than any other people in human history, that the maxim that they cling to most proudly comes from Martin Luther King Jr (not even his real name — watch the documentary ‘The Beast as Saint’. MLK is admired like a bed of roses in the USA — but as they say, every rose has its thorn!) That said, schools are also to blame for not properly informing our youth about how much our ancestors accomplished, but I digress. Secondly, it is extremely short-sighted (although some might accuse these folks of knowing exactly what they’re talking about) to claim “merit” and “content of character” as being the only things to weigh, especially in a globalised world. It is a uniquely liberal trait that is not generally shared the world round. When the “economic immigrants” that centrist conservatives like Jason Kenney, Stephen Harper et. al. 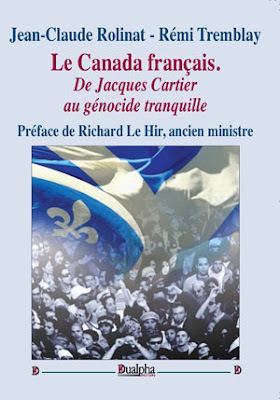 heap praise on enter Canada — especially those that move to Greater Toronto and Greater Vancouver — they aren’t thinking about things like “merit” and “reflecting all the colours of the rainbow”, or whatever tripe we’re all supposed to adhere to nowadays, even though most of us (including those outside the identitarian movement) know it is tripe. They are thinking long-term. They are thinking about how to exploit the self-destructiveness of Canada’s socio-political trend for the benefit not merely of themselves, but of their own people. When they raise families of eight or more children, they aren’t thinking about the burden upon their own lives that having such a large family will have — having large families is all part and parcel of their conquest. Although selfishness is a part of human nature, the philosophical concept of individualism is something relatively new to the world — born out of the French Enlightenment and kindled by American revolutionary ideals — and Canada is one of the few countries where individualism has pervaded as strongly as it has. This has left the playing field very unevenly balanced in favour of those who comes from cultures where group work and communitarianism is more prevalent. Inevitably, we are drawn into the whirlpool of unending debate and vitriol as to whether it is better to support the most powerful (semi-)conservative parties — the Conservative Party of Canada, the Progressive Conservative Party of Ontario, the United Conservative Party of Alberta, etc., in order to avoid vote-splitting — or if it is better to consider the mainstream conservative movement to be horses not worth whipping, and to move on to building real alternatives. That debate will never be settled here, and it is not my business to be telling you who to vote for. But it is important that all of you follow the trends of where the mainstream conservative parties and related organisations are being pushed. Watching CTV’s "Power Play with Don Martin" recently, one will be exposed to journalists and former political party staffers who think that it is not enough that the likes of Jason Kenney and Andrew Scheer condemn white nationalists and prohibit them from running as candidates — they believe that these party leaders must also forbid anyone from even holding these points of view from even being party members! (Back episodes of ‘Power Play’ can be heard on CTV’s podcasts on their website, if you want proof). So where then, do we go from here? There is some possibility that the mainstream conservative parties will be forced, in the face of blinding evidence, to accept at least some of our beliefs on our world and our place in it. I point to the progress that the climate change activists have made in transforming their beliefs from quaint to unchallenged in the mainstream, over a period of less than twenty years. With enough similar vociferousness, it is possible the mainstream may have no choice but to also consider us and our beliefs normal. For those who don’t believe that’s possible, I also welcome you to forge new vehicles through which to purvey our beliefs. What must never be compromised on is our belief that our people have been uniquely gifted by Nature to lead humanity forwards in Civilization. If we waver in that belief, our draw on people who are considering joining in on our movement will also waver; nobody wants to get on a ship whose crew does not have full confidence in their vessel.